If you are mining Scrypt crypto currencies such as Litecoin or maybe DOGE, then you are most likely using cgminer as a mining software or something that relies on cgminer as a backend. The author of cgminer (Con Kolivas) however seems to have decided to continue support of cgminer only for ASIC mining for SHA-256 cryptos such as Bitcoin and version 3.7.2 is the last one for cgminer to support GPU mining for scrypt crypto coins. Furthermore the windows version of the last cgminer to support GPU mining has been removed from the official download location, you can however download cgminer 3.7.2 with GPU support for windows here. More importantly, there are already some alternatives that are based around the original source code of cgminer 3.7.2, but add extra features and offer improvements that are not found in the original software. One such version based on cgminer 3.7.2 is Martin “Kalroth” Danielsen’s cgminer 3.7.2 that he calls cgminer 3.7.3 in order for the users to be able to differentiate between the original and his version. 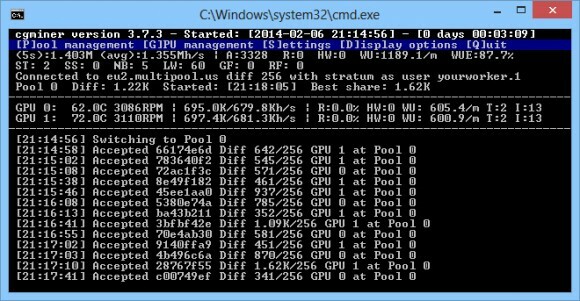 In cgminer 3.7.2 kalroth (cgminer 3.7.3) he has made changes to the visual interface to make it more user friendly and functionality that can help you squeeze a bit more performance out of your GPU mining hardware. Some of the notable differences include support for multiple pool load balancing, implementation for idle state for GPUs when there’s no work, two additional modes for controlling intensity – xintensity and rawintensity for additional performance, faster failover pool switching back delay and interface improvements such as uptime status or percentage of rejected shares and so on. Definitely something to try and see if you like this version of cgminer better than the original 3.7.2.